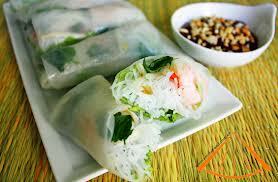 Spring rolls offer a great way to feature fresh summer veggies and make a light summer meal or great appetizers. For carnivores, a variety of cooked meats can be added to the roll. Poached shrimp makes a nice addition along with mango and cucumber slices. Well-seasoned shredded beef, chicken or pork can also be added for a hearty roll. Be creative with a mix of flavors and textures. Whatever the filling, just make sure it is not too moist or the wrapper will get soggy. Soak the noodles in hot water to cover until soft and pliable, about 30 minutes. Drain and snip noodles into 2-inch lengths. Combine grated carrot, noodles, bean sprouts, cabbage, scallions, herbs, and sugar. Smash the garlic in a mortar or food processor with a pinch of salt and chilies to make a paste, then stir in the lime juice. Toss with the vegetables. Fill a bowl with warm water and spread a clean towel on the counter. Working with one paper at a time, slip it into the water and soak until soft and pliable, about 10 seconds, then remove and set on the towel. Mound some of the vegetable mixture at one end of the rice paper, roll it over once, fold over the sides, and roll to the end, making a neat little package. When all are done, slice the large rolls in half. Serve with dipping sauce. Recipe adapted from Deborah Madison’s Vegetarian Cooking for Everyone.